New Zealand Warrior and World Cup winner Sam Rapira has signed with the Huddersfield Giants for next year. The 28-year-old prop is expected to link up with the Giants for pre- season in mid-November and has his sights set on finishing his Warriors career at the very top after having signed a two year deal with the claret and gold. 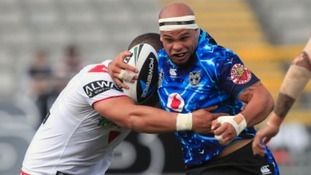 After 10 years at the Vodafone Warriors, I can’t wait for the new challenge of playing English Super League. I decided to sign up with the Giants because I’ve heard positive things about the club and they have shown a lot of enthusiasm in getting me over there. I’m really grateful for this opportunity and I look forward to working with Paul Anderson and the boys. The thought of moving to the other side of the world with our two daughters is a bit daunting but our friends and family have been supportive throughout this process and we are excited to experience a new country and culture. We’ve had lots of advice from Sam Tomkins and his partner Charlotte and it’s nice to know that we’ll have a few English friends over there in addition to our Kiwi friends. He has played at the very highest level throughout his career and to choose us to spend time with in the UK is great testament to what we have built up over the years here and a clear message of where we want the club to be. Sam is a winner and a tough competitor who will enjoy the conditions here after he has finished his outstanding NRL career. He had options here and in Australia so we are delighted he has joined our club in the face of a lot of other possibilities. He is an out and out prop forward and someone who we will look to for the simple but effective and necessary role in getting the side moving forwards and making our middle unit a tough spot to run into.